Posted in appetizers, French, recipe, savory, Spanish by Antonio Tahhan on November 9th, 2009. You can follow any responses to this entry through the RSS 2.0 feed. You can leave a response, or trackback from your own site. 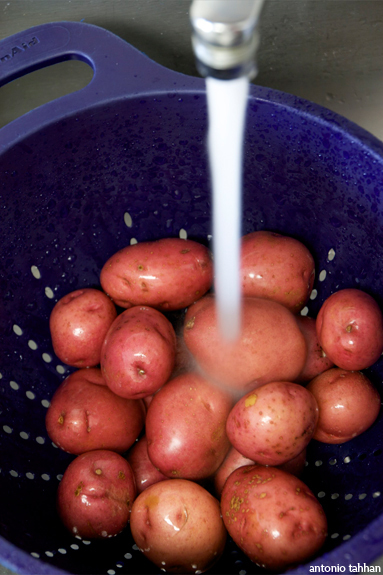 Wow this is a great potato recipe. We love roasting them in the oven but I love these flavors! Looks great! I can’t wait for your fresh recipes from Aleppo! Have a safe and a wonderful trip…looking forward to your posts, photos and many recipes from Aleppo. I’m so jealous of your trip. I would go to Aleppo for the food. This will be incredible. Can’t wait to see the pics of your trip. Thanks for the warm wishes everyone!! 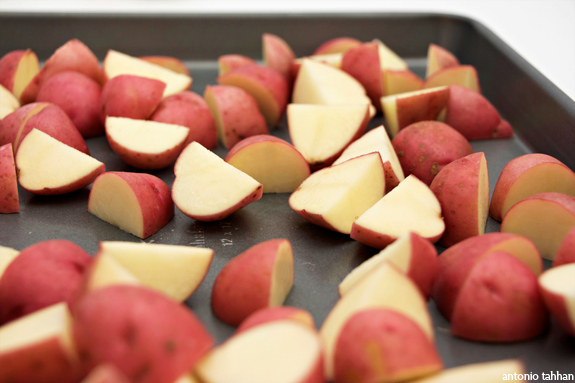 I love red potatoes roasted with their skin. 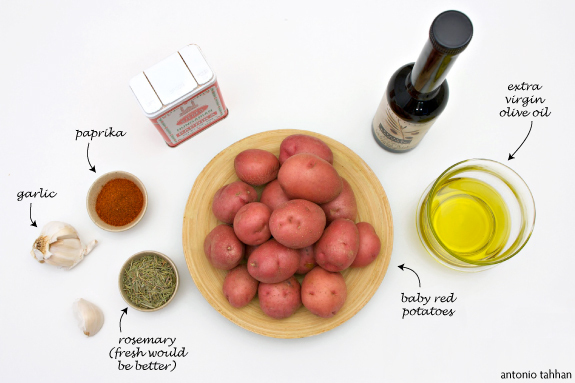 Great simple recipe which is what potatoes need in my book! Have a great trip…look forward to seeing the photos as well. Tony we made the oven roasted potatoes last night and served them to a bunch of friends – everyone loved them. Thanks for the recipe and stay safe my friend. A gorgeous spuds dish. I love rosemary with potatoes and paprika gives them that somethin’-somethin’. You must buy some Aleppian red pepper , it`s very important in our cousin . Wish u enjoy your trip & if you want any help , Im here . The potatoes look yumy . Have an absolutely wonderful trip. I do hope you’ll blog about it when you get back! Sounds lovely. 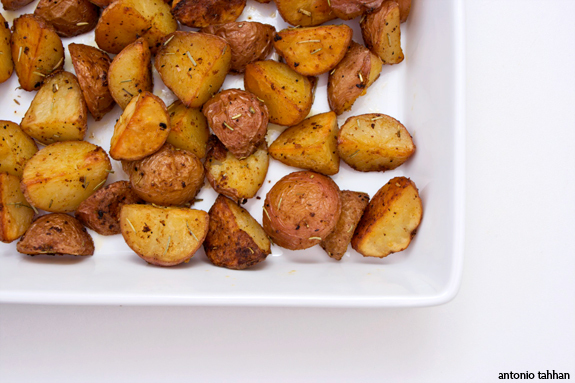 I am a big fan of roasted potatoes with rosemary – yum! 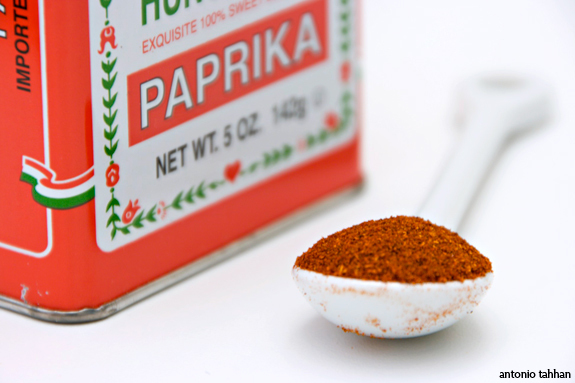 And the paprika certainly doesn’t hurt. Have fun on your trip. I am so jealous of this trip, but so happy for you at the same time Tony! These potatoes look divine, can’t wait to see your photos and recipes from Aleppo!!! These potatoes I would not be able to resist! Antonio! The pictures for this post are particularly stunning. I hope you are having a wonderful trip, and will expect a full report when you get back. A little animal fat will bring these to a whole new level!! Though these already look fantastic without.